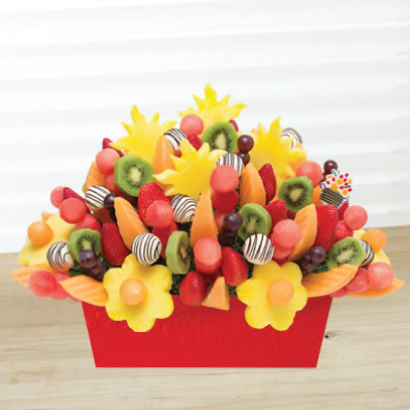 This refreshing summer fruit arrangement is the perfect addition to all your summertime plans: summer BBQs, graduation parties, gifting and more! The new Watermelon Kiwi Festival™ features juicy watermelon, sweet kiwi, and fun, sun-shaped pineapple. We have also added our fresh pineapple bites dipped in white chocolate with dark drizzle, included in your fruit bouquet for the perfect presentation. It’s all artfully arranged in our signature keepsake container so that you can use the container long after the fruit is gone! Container may vary.